2m of DNA is packaged into each of our cells (actually most cells, since mature blood cells for example don’t have a nucleus). It’s amazing that 2m can be crammed in to such a tiny space, but how the cellular machinery accesses the critical parts of that DNA to initiate gene transcription at just the right time is completely astonishing. Euchromatin and heterochromatin refers to the lose or tight packaging of DNA in the nucleus and it is in areas of loose packing that most gene transcription is taking place. Here I am trying to represent some variating in DNA packaging in the nucleus. 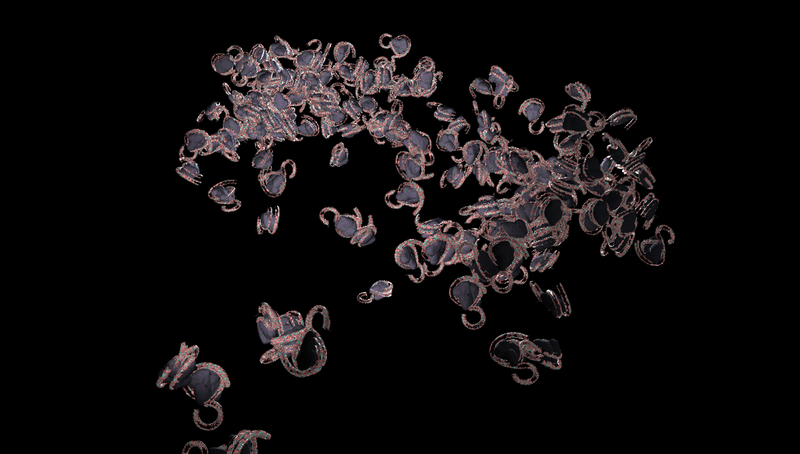 It is part of an animation and I have used particles with instanced geometry I built to represent one nucleosome. The Geometry has some simple bump mapping and images mapped as a texture to represent the DNA molecule. The particles have some random rotation applied and some scaling to give the effect of random, organic motion that might occur within the nucleus.